Yes, I love me some fashion. But to be honest, I wasn’t really good at putting outfits together for myself. It took me a lot of years to discover my own style and find clothes that actually work together. Clothes that work for me instead of against me. If you have the same problem, I suggest you watch this video about finding your style first. 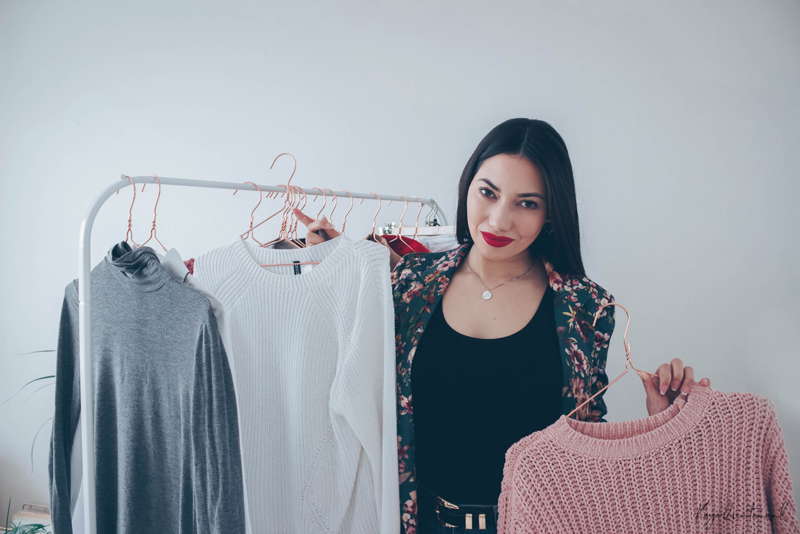 Do you already have your style down, but don’t know how to style your clothes? 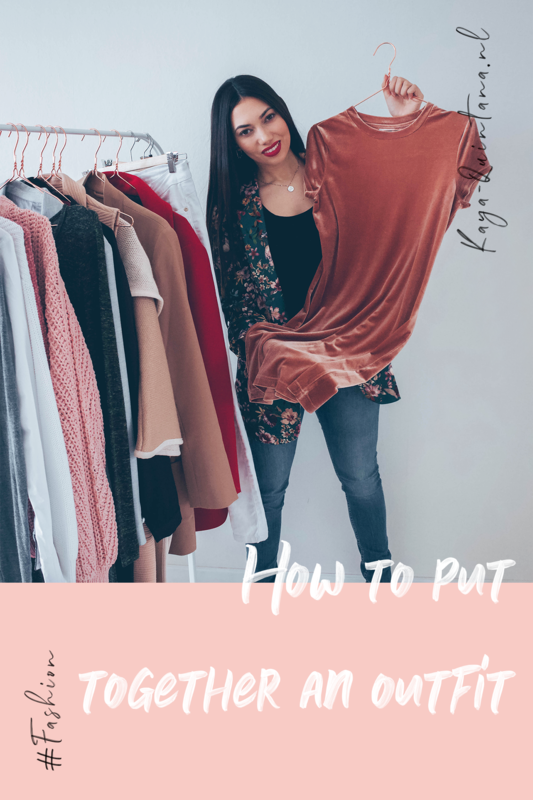 Then let me show you how to put together an outfit in this new article and video, let’s go! It’s very important to know what your style is first. Your style portraits who you are and how you want people to look at you. It also sends a message about your mission in life or your character. Your style can change every day, from casual to super glamorous. That’s why the first thing you do when you style an outfit, is figure out what your style for the day is going to be. When you know what you want to share with the world today, it’s time to dive into your closet. Let’s say you want to look like you’re ready for business. Grab all the business appropriate items from your closet and hang them on a rack. You can also lay them down on your bed or floor, it’s up to you. Just make sure it’s easy for you to see all the clothing items in full length. Style noobs often need a visual representation of the possible options. 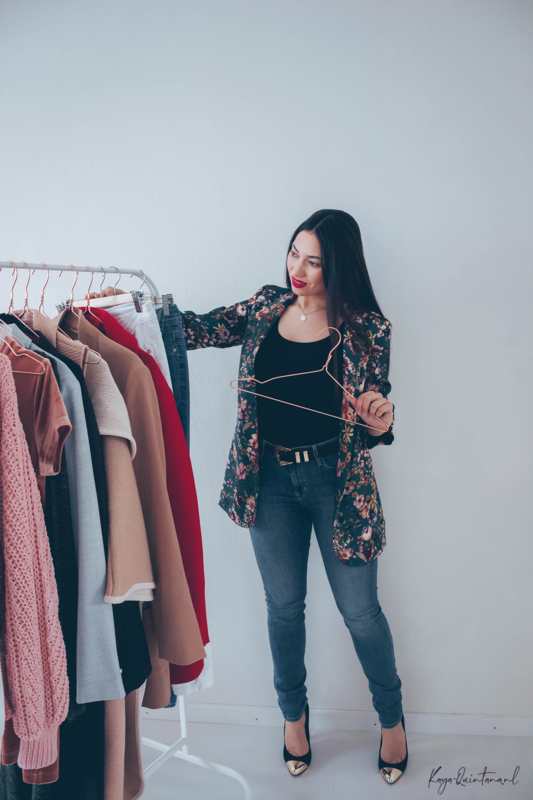 You might have noticed that stylists in stores, photoshoots and show also work with a clothing rack. If you have one, use it! A rack for your clothes will make it easier to make style decisions. 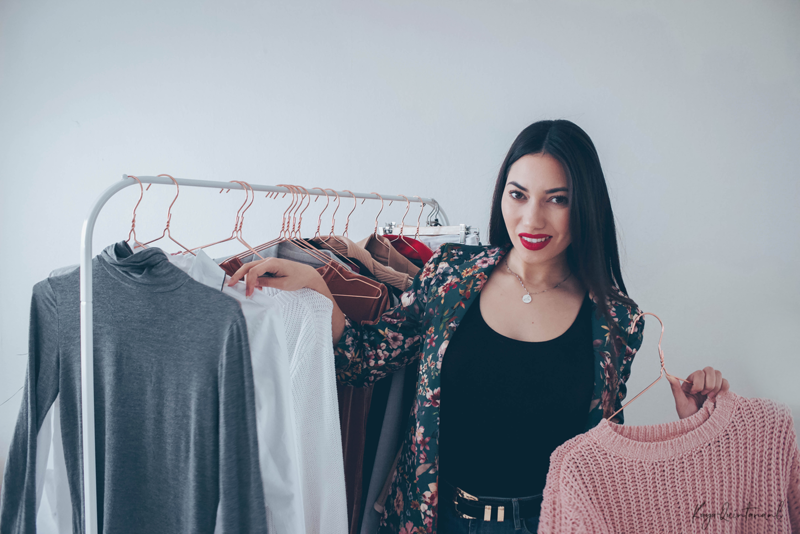 Now that you’ve got all your business style clothes hanging on your clothing rack, it’s time to sort them out. My best advice is to do this per item and per color. Meaning that you grab all your jeans, hang them next to each other and then organize them per color. You can start from light to dark or the other way around. Do the same thing with blouses, t-shirts, blazers, sweaters and what else you may have on your rack. Items with a print could be sorted on their most dominant color. Great, you’ve got everything sorted on color. Now it’s almost time to start styling. To do this, you have to make sure you organize your clothes from left to right. Starting with tops, t-shirts, sweaters, cardigans, blazers, jeans and outerwear. Shoes can be stored on the floor under your clothing rack. Accessories can be laid out on the table or your bed. Organizing your clothes this way will help you get dressed faster. As most people start with putting on their tops before their bottoms. This makes putting together an outfit much easier. This is where we start styling. Push your clothes to the far right on the rack, so you have some space in the front. This is where you are going to hang your outfit options. Since you’ve already sorted everything on color and item, it’s going to be much easier to put outfits together. Start with a top, grab a pair of jeans or a skirt that matches it. Try adding a cardigan or a blazer on top of it. Look down to your shoes, which pair would match this outfit? Keep putting outfits together like this until you have three choices. Congratulations, you’ve just pulled and styled three outfits just like a real stylist would for a client. But as you know, the fittings are the most important part of styling. So get undressed and try your three outfits on in front of the mirror. This is where you’ll get into the nitty gritty. An outfit may look great on the rack, but not on you. This is where you tweak your look by adding a blazer or taking of those earrings. Maybe you only have to tuck in your shirt to make it work, try it all out until your outfit is complete. Now you know how to put together an outfit. It will probably take a bit more practice, but I have one tip to make styling outfits a bit easier for you. Whenever you’ve styled an outfit you like, take a picture of you wearing it. Ask someone to help you or take a good old mirror selfie. Store the pictures in your phone or print them out, which is even better! You can also take polaroid pictures of your outfit. You can write on the back what the outfit is about. Think about the style, brands, accessories and what occasion. This is how real stylists around the world love to work as well. By putting up the polaroid’s of your outfits, you always have some ideas to get you started. You don’t even have to think about styling anymore, because you’ve already done the work. Just grab a polaroid you like, check what items are in the outfit and put it on! You can create a really cool grit with all your polaroid pictures on your bedroom wall. You can also stick them to your closet door and make your very own style palace. Now you know how to put together an outfit, go shine! P.S. Check my Youtube channel for more style and fashion tips.